Welcome to your latest Obsession Confession! Well I have to say, I’m not one of those people that can eat the SAME thing everyday. Let’s face it, it’s boring and you feel deprived and deprivation leads me to The Cheesecake Factory so I like to switch things up. But, as a single traveling girl I need portable things I can throw in my suitcase…. Enter True Lemon and cue the angelic music…ahhhhhhhhh! It was a stormy Saturday afternoon and a bright, yellow, sunny box arrived. I opened the box and an array of true lemon products arrived! Lemon, lime, and orange shakers, drink mixes, recipes all made naturally! As most of you know I’m a Southern gal and I LOVE LOVE LOVE my tea! So I always order unsweet tea (no more sugar) with lemon or I make my own, but I can’t tell you how many times my lemons go bad!! (why does that sound like I’m talking about my chest?) Anywho, I put it in my tea with my stevia and it was just like real lemon!! It was amazing. Then I tried one of the water packets (raspberry lemonade) and mixed with my water. It was amazing, no artificial taste and it was light and refreshing! True Lemon has so many products: orange, lemon, lime and more. You can use the shakers in liquids and also to season your food! I have used the lemon on fish and the lime on tuna and the orange in my fruit salad! I love a multipurpose product that I can carry on the go and travel with! 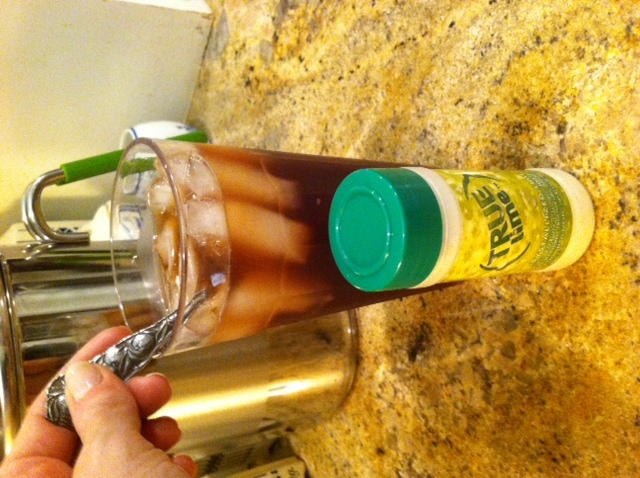 I give true lemon two thumbs up!! They even come with recipes on the packaging!!! Haven’t tried it but it sounds great! Where can we get it? By the way, I’m wondering if you two do a “Shape Up Week” sort of thing to take things up a notch. I am going to do it later this month and would love some team spirit! Lisa: You can purchase the entire family of True products online ( http://www.truelemonstore.com ) or you could check to see what stores near you carry them ( http://www.truelemon.com/store-locator.html ). Where can we get it? By the way, I’m wondering if you two do a “Shape Up Week” sort of thing to take things up a notch. I am going to do it later this month and would love some team spirit!! Yes – I’m a believer of the True Lemon Raspberry packets! I use them in a recipe for homemade lemon protein bars. Will have to venture out and try this with my water, as I am known for ordering water with a side of lemons and adding stevia for a homemade lemonade. p.s. glad to hear I’m not the only lemon killer out there. 🙂 I either don’t have a lemon when I need it or I have too many and the shrivel up. I LOVE a little tea with my lemon but have never heard of this! Is it only available for order online? To everyone wondering where to buy this: you can get it at any supermarket. It’s with the other drink mixes (like Crystal Light or Tang or whatever). I’ve tried the Raspberry Lemon with my water and LOVE it, but never thought to use it as a seasoning! LOVE this idea!! Great post, Han! What an idea! I have to put things like lemons in prime locations so that I don’t forget about them. And I am a green tea drinker. Do you have a particular buying location in mind? although I myself might sacrifice this luxury until I pull in moola. I’m going to try it!!! On another note, I would love for you gals to post info about your favorite nail products. Your nails always look great and I’m always looking for better products to make my nail polish last longer. I’ve tried the lemon and lime drink mixes but had no idea about the other options. Can’t wait to try them! Kristen I am from IL too and I LOVE my iced tea. I drink almost a gallon by myself in a day and a half. Do you know when the BL 2012 final will be? I started buying these a few years ago. They sold just the lemon, lime, and orange ones in the little packets in the baking supply aisle at the grocery store. Didn’t care much for the orange tho. True Lemon in hot water does wonders for congestion. Not sure why but it does. I tried the Raspberry a few months ago and loved it. Love that its not filled with chemicals. I have a sensitivity to food dyes so this was a good find. Absolutely!! Jillian’s passion for good pure foods is rubbing off on me. I have eliminated so much of the processed fake foods and I feel so much better not eating that stuff. I wish everyone could feel how much better I feel so they would know too. Does that make sense lol. Lindsey, thanks so much! I did find them at a grocers right up the street from work 🙂 Yippee!! Can anyone tell me, is this the group I learned about the Jen Bar from? I promised to give my feedback on it and now I don’t remember what group it was 🙁 thanks for your help. Girlfriends, this came at the PERFECT time! I hate water!! Like, will do anything not to drink it and a lot of the flavoring packets that I have bought to force myself to drink it aren’t exactly healthy. I am donating bone marrow this coming Thursday (prayers please – for me and the recipient) and have to be extremely well hydrated. Well, I’m never well hydrated to begin with (which is probably why I have a tendency to pass out and see spots – even when I’m not working out), SO I’m going to go out tonight and see if I can find some of these to try out! I just got the lemon flavor,and it is so good in my homemade iced green tea. Nothing artificial…who knew? Yum. I purchased this product last week in an effort to drink more water. It is working. I am up to 50 oz of water now. The Original Lemonade and Raspberry Lemonade are great. Even though it says to add the product to 16 oz of water, I find that if you put it into even 20 oz, it still tastes great. Grocery stores in the NJ area seem to only carry Lemon, Original Lemon and Raspberry Lemonade. I enjoy drinking from a mason jar (with the oz marked on the side) filled with water and True Lemon and monitoring the ounces I consume in a fun and trendy way. Unless I am halucinating, my skin seems to have improved and I feel better overall.